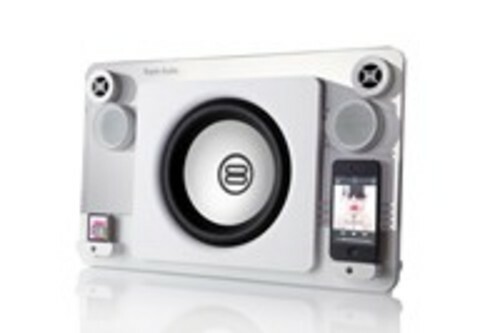 Bayan Audio unveils its premier iPod/iPhone dock with a world-first twin amplifier set-up driving a monster 120W of sound power. Bayan Audio is a division of Radiopaq Ltd, incorporated during October 2007 and is based in the United Kingdom. Bayan Audio specialises in design development and manufacturing of home audio products. Bayan Audio aims to be one of the best choices for home audio solutions to work with contemporary media players such as the Apple iPod series as well as other media platforms like Android based Smartphones and media tablets, and in the future, Ultra Notebooks. The Bayan range is a result of more than two years in expert research, design and prototyping, the result is a family of home audio docking stations which break the boundaries and sound noticeably superior to any comparable product with a similar price tag or higher. The Bayan Audio team enjoy music and support Nordoff Robbins, a charity helping those who cannot enjoy the music in the same way. If you would like to be placed on the waiting list for a product review sample, please contact the press office or download and return the sample request form on the press assets pages. This press release was distributed by ResponseSource Press Release Wire on behalf of Tru PR in the following categories: Men's Interest, Entertainment & Arts, Leisure & Hobbies, Home & Garden, Women's Interest & Beauty, Consumer Technology, for more information visit https://pressreleasewire.responsesource.com/about.